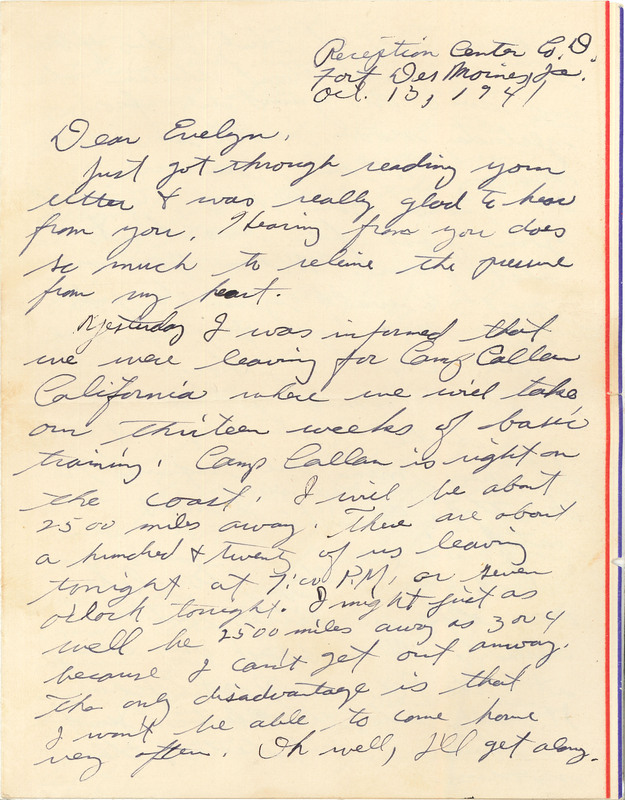 Reception Center Co. D. Fort Des Moines, IA Oct. 15, 1941 Dear Evelyn, Just got through reading your letter & was really glad to hear from you. Hearing from you does so much to relieve the pressure from my heart. Yesterday, I was informed that were leaving for Camp Callan California where we will take our thirteen weeks of basic training. Camp Callan is right on the coast. I will be about 2500 miles away. There are about a hundred & twenty of us leaving tonight at 7:00 P.M. or seven o'clock tonight. I might just as well be 2500 miles away as 3 or 4 because I can't get out anyway. The only disadvantage is that I won't be able to come home very often. Oh well, I'll get along.